Refutation: Jesus says that the Father is greater than he is, proving that he is not God. Jesus says that the Father is greater than he is, proving that he is not God. There is no one who is greater than God. Yet, if God is a Trinity, a Trinitarian Being (i.e. one eternal God existing in three distinct, yet inseparable Persons), then it is quite possible for one member or Person of the Godhead to be greater in some sense than the other members. It would be true that nothing outside of the Holy Trinity’s own existence could ever be greater, but this doesn’t necessarily imply that there cannot be some type of authority structure or ranking within the internal life and relationships of the Trinity itself. Logically speaking, this form of reasoning is highly fallacious. Since each member of the Godhead is fully God, and God is perfect in each and every way, to have one God being superior to another God, has to mean that the definition and understanding of God has to change. We must accept that God is perfect, one perfect being cannot be superior to another unless one is less perfect than the other. If a being who is assumed to be a God is not absolutely perfect, then this being cannot by very definition, be considered a God. Hence for there to be a hierarchy within the Godhead, we are dealing with one superior God and two lesser Gods. This presents a theological conundrum, as it must be understood that if the first God in the hierarchy is perfect and there is a second God, then this second God is less perfect than the first, thus it logically follows that the third God would therefore be less perfect than both the first and second Gods. With this in mind, it would be best that Sam disuse the premise that their could possibly be a hierarchy within the Godhead. Notwithstanding the evidential fact that the Godhead in itself is polytheistic in nature. “And I will do whatever you ask (αιτέω) by (εν) my (μου) authority (ονομα), so that the Son may glorify to the Father. You may ask me for certain things (τίς) by (εν) my (μου) authority (ονομα), and I will do it.” – John 14:13-14, based on the GNT of the Nestle Aland 26th Codex, by way of Strong’s Greek Lexicon. “On that day you will know that I am before/ wherewith (εν) my Father, and you are before/ wherewith (εν) me, and I am before/ wherewith (εν) you. Whoever has my commandments and obeys them, he is the one who loves me. He who loves me will be loved by my Father, and I too will love him and show myself to him”. – John 14:20-21, based on the GNT of the Nestle Aland 26th Codex, by way of Strong’s Greek Lexicon. Sam’s logic is that if God accompanies the believers with Christ, then Christ is claiming he is co-equal to the Father. Using Sam’s logic, since the believers are going to be present with the Lord in the same way Christ is present with the Lord, then the believers are all ‘clearly claiming co-equality’ with the Father. Since the latter is nonsensical, how can the former be true? Sam’s logic is clearly infantile, if it cannot work both ways, why does he expect it to work one way? This then, manipulates the full meaning of the text beyond its intended scope. 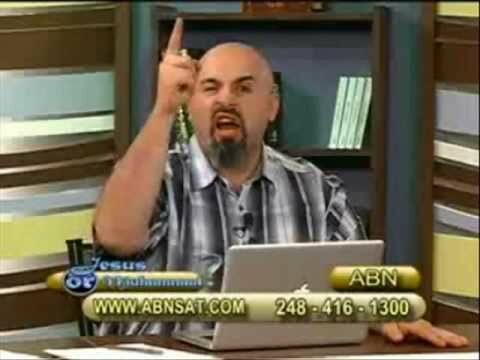 Sam spends the rest of his time trying to equate Christ with the Lord, all of which are easily explained and debunked with employing basic logic and reasoning. Sam’s conclusion is beyond absurd and borders dogmatic arrogance. How can the Father’s rank not describe his essence? How can the Father be greater in rank, but equal in nature? This is like saying, in a track race, the three fastest runners are equal, but the one track runner is first, another second and another third. There clearly is a contradiction in his reasoning and the more he tries to explain it, the more he seems to put his foot in his mouth. Think of it this way, if the Father is the exact same to the Son in essence and nature, in what way does the Father differ to be superior (greater) than the Son? Sam’s answer is that being greater means that the Son is still the same with the Father, therefore it is either that Sam does not understand the meaning of the word ‘greater’, or the word ‘hierarchy’ or he does not understand the meaning of both those words and the logic behind them. Since this is the case, consider this to be another case of Shamounian logic. It seems you have made the mistake of not understanding what Christians believe, it is obvious to me that Sam is speaking from the Jesus position on the earth as a man or should I say God-man. If that is case then it makes perfect sense if you believe in the Trinity take these scriptures for example. Why mention Spirit,Lord and God meaning the Father why not just say God does all three. Why not just God raised him from the dead? Why mention not just the testimony of Paul but also from Jesus himself. don’t u see that this polytheistic minded pagan bit**h is catholic in disguise? john paul is of the same nature which is flesh, but has a higher rank. queen elizabeth is made of flesh, but has a higher rank. police are made of flesh but have a higher rank. don’t you see that he is injecting human ideas into his god? there is a reason why christians are not monethiests put 100 percent polythesit pagans. why they have a problem with attis, innana, osiris is beyond me. if you put the 3 in a boxing ring the father would dominate each round because the other two are subservient to the rank of the father lol lol it is like a son says to his father after his father slaps him , “good thing you are my father, otherwise i would kick the hell out of you” this is what these pagans are saying indirectly , otherwise there would be all out war in the trinity god . make them disagree and have the son abuse the father and father abuse the son with their natures. shamoun is only making agreement between his pagan gods because he wants to keep the persons under the umbrella called god. what is the difference when one says vishu, prabhu and shiva rose jebus from the dead? you think 3 coquals rose dead meat from death? if one person had the ability to RAISE the dead meat from the death then why does there have to be a communion to raise dead meat from death? in the same way if 1 person can do the job without HELP from the other person, then what point is there for each person raising the dead meat? these items ARE SEPERATE TO honest minds. Can you help me in regards to the scriptures I posted yesterday I want to get a Muslim perspective on these verses, I’m not really interested in what Sam Shamoun is saying because the verses I have given speaks about the Trinity having a part to play in the resurrection. We are not talking about Hindu gods I’m talking about the verses I posted do they reveal a rank in the decision to raise Jesus from the dead? In any case the Hindu’s believe in many gods which I do not believe in three gods. Even the koran says “say not three” but it does not qualify what it means by three and yussef Ali’s translation of the koran makes a grave by putting “Trinity” when it is not in the original Arabic text…it was added. Nowhere in the koran is it stated that there is no Father ,Son and Holy Ghost and so to be against the Trinity when the koran does not say against it is ignorance. Can you post a text from the koran that speaks against Christian trinity not three gods but what Christians actually believe. This is exactly why Christian apologists are so hard to nail down. The Biblical God is made of theological Lego Bricks that can be added and remove as the occasion arises, especially in apologetic arguments. It is here that these Lego theological bricks built the Bible (with its God) and now it builds Jesus (notice I use the active verb as Jesus can be changed without notice to keep him theologically functioning in any debate). DON’T LIE . you are a polythiest, why is that hard for you to believe? if an EYE was stretched ACROSS 3 PEOPLE , we would call it “shared eye” in your pagan religion, you have 3 PERSONS ,each who have a brain of thier own and each who is ABLE TO FUNCTION WITHOUT THE ASSISTANCE of the other. what do you call this? if america, britian and china used one sattellite to spy on russia, would it mean that 1 land is spying on russia because it is using ONE SATTELLITE? the 3 bodyless pagan spirits/persons u worship and who have “loving communion” are 3 pagan gods under the umbrella/BUILDING/COMPANY called “god” why can’t u see this simply fact? tell me why does gods love include having his CREATED flesh mauled and then hung on a stick? if a person said he loved you and that his love included CUTTING himself with a blade to make himself suffer, would you call that sane? god shows u how much he loves you by getting whipped so that his flesh is open? just IMAGINE that right now and tell me why do you people get a buzz out of flesh getting torn? why this gruesome and sadistic way? now you are repeating yourself here? I admire your stamina, dear Ijaz. I’ve read some of the stuff from our favourite polemicists on Answering Islam and I must say, I’m not particularly impressed (though when you try to raise methodological problems you get told you’re wasting your time, and theirs too). Unfortunately, few minds will remain changed when it comes to the AI lot – there is a serious lack of intellectual probity – it’s far more polemical than informative – I hear so much about Christian humility and the want of my Christian friends to emulate Christ – but ; rather than taking Muslims in what they believe and looking at the whole (hermeneutic) history of Islamic scholarship, their website caters to their interpretation of what a ‘Salafi’ should believe – which is just nonsense considering that the breadth of Islamic scholarship is much, much wider than just Ibn Taymiyya or the Hanbali/Ash’ari traditions. *EDIT :”which, as someone who happens to believe that God is beyond description and cannot be pinned down in an essentialist sense, this causes problems for. Hello defendchrist, how can you claim the Holy Qur’an does not condemn your trinitarian beliefs, when you very well know that it denies the divinity of Jesus Christ? By doing this, the Qur’an shows that, just like a three-legged stool, all you have to do is rip one leg off and the whole concept will come crushing down. Hey Atheist claim there is no god does that mean their statement is true? The koran can say what it wants that doesn’t make it true. It denies the crucifixion and doesn’t even explain that clearly. Where does the koran condemn the trinity? And what I mean by that is the Father the Son and the Holy Ghost. If you don’t believe in the deity of Christ that’s ok but you’re just wasting your time trying bring down Christianity it’s not going to work. There is no God-man. There is one God. God is no man. “Deity of Christ?” Words without meaning. Hi defendchrist, I didn’t mean to hurt your feelings. You appear to have missed the point of my post. I showed that for your Trinity to be valid, Jesus must be God the son. The Qur’an, however, denies the divinity of Jesus. The Qur’an, therefore, indirectly condemns the Trinity by denying one of its participants a share in divinity. For the Trinity to be valid, Jesus should be divine. The Qur’an, therefore does not support the union of Christ, the ‘father’ and the holy spirit in divinity.